The power of one. It took one woman – with all her charm and passion- along with a healthy appetite, to chart the course of another. And it all came together in the kitchen. One match. One flame. One bite. One soul. We’re all inundated with bounty. Choices, decisions, friends, tasks, emails, voicemails, family, Costco packs, honey-do’s. So much so that as we weed through all of the things we have to do, one can seem like just one too much. But when you boil it all down, one may be all we need to move a mountain, to take a leap of faith, to ride a wave of success, to achieve complete bliss. It may sound incredulous and even naive, but for one person, it took one inspiration, one decision, and one person to believe in her to make her life more bountiful than she could have ever imagined. If there was one thing I would like to share, it’s the importance of mealtime. One experience, one laugh, one unforgettable conversation over the table can sow the seeds for a lifelong friendship. One dish, one flavor, one aroma can forever change how a person thinks about the food on their plate. One caring soul, one gesture, one unselfish act of kindness can soften the shell of bitterness. One dinner shared with one person can leave indelible, beautiful memory they’ll always cherish. We thank Julie and Julia for inspiring us at Eat Cleaner to be one better, one stronger, one kinder so we can share our message of a cleaner plate for all…one important bite at a time. Pass it on and become a catalyst for change. What does it mean to eat cleaner? It’s not a diet. It’s a lifestyle and a balanced approach to food – from its nutritional content to how its prepared – bringing you better health, one bite at a time. At the end of the day, it’s the quality and quantity that count. 1) Eat frequent, small meals throughout the day. Pick lean protein, plenty of fresh fruit + veggies and a complex carbohydrate with every meal to keep energized and burning calories long after your workout. This also helps control portion size, which can often undermine a good diet. 2) Drink at least 8 glasses of water a day. Water helps flush toxins, keeps you hydrated and controls your appetite. Thirst often disguises itself as hunger. 3) Avoid processed and refined foods. Fresh is best. Fill your shopping cart with foods from the perimeter of the store and opt for complex carbs that are richer in nutrients. 4) Consume healthy fats. Brain and organ function depend on healthy fats, found naturally in seeds, nuts and fish. Consider supplements rich in essential fatty acids if you don’t consume these regularly. Eat Cleaner Grab n’ Go Wipes let you snack healthy on the fly. Use them to clean fruit, even if they have a peel, to avoice cross contamination. No rinsing necessary! Wax and pesticides and soil, oh my! Turns out there was a lot of cleaning up to be done in Orange today! 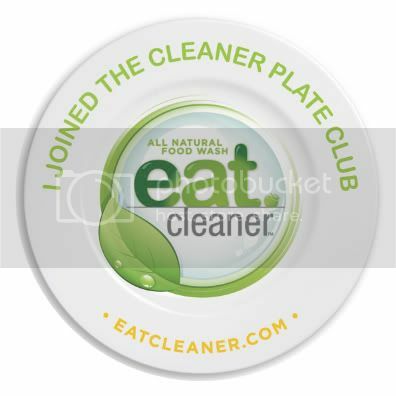 Eat Cleaner headed out to the OC Parenting Magzine Family Expo at the The Village Mall in Orange, CA today and got the mall goers versed on how to get their food squeaky clean. People were surprised at how crisp and fresh the apples tasted after being washed with the Fruit + Vegetable Spray and amazed at how the flesh stayed nice and light hours after being treated with the product. We also gave the Wash + Dryer Kit a whirl and got the crowds going with the Spray, Soak and Spin method. Lucky ducks got a bonus offer of a year long subscription to Martha Stewart’s Everyday Food Magazine with their purchase, available on our website at www.eatcleaner.com. Grab ‘n Go Wipes were a big hit and we sold out of those faster than we could slice up fruit! Eating Cleaner is a matter of getting into the habit and people seemed to really get the message. We made a lot of great friends today and a special thanks to Randall, Ann Marie and Shane Tierney, founders and publishers of the magazine for all their help. You guys do a lot to give back to families across the Southland. Good taste can take you places you’ve never dreamed of. No matter where you’ve been, you’ve probably had a great dining experience that’s rocked your world and defined the moment. From a five-star culinary feast to out-of-bounds street food, the meal makes the memory. It’s an experience that knows no boundaries and a language that can leave you speechless. Rudyard Kipling once said “The first condition of understanding a foreign country is to smell it.” From the aroma of a Puttanesca sauce in Roma to the pungent, exotic smells of a Punjabi curry to the irresistable waft of grilled kebabs in the streets of NYC, your nose has a way of leading your journey. Whether you’re about to take off on the trip of a lifetime or an armchair adventure around the world, you’ll appreciate our ‘Street Food Comes Clean’ recipes, the “Good Trip Guide” to healthy road snacking and a taste of cleaner food to come. Making a clean getaway lets you embark on a healthy journey around your tastebuds every day, no visa required. Some of my favorite food in the world is Thai. Curry in any color and pretty much anything dipped in peanut sauce rates high in my book. However, trying to be an adventurous traveler, I became sicker than a dog whenI visited Thailand and got a serious case of food poisoning after eating chicken satay from a street vendor. Major bummer, considering I had just started a landmark 3 week vacation and spent 2 1/2 of those out of commission in my hotel room. If you don’t have guts of steel or you’re trying to get healthier, you can still take the best of the street and help it clean up its act by using ingredients you can trust, made in your own kitchen. The perfect snack on a stick. Make it using organic, free range chicken and beef and make the peanut sauce with organic peanut butter and clean cukes. A burrito gets healthy street cred when you fill them with black beans from Eden Foods, brown rice, Horizon Organic Shredded Mexican or Cheddar Cheese and Sour Cream along with a generous helping of clean veggies, like roasted bell peppers, tomatoes and corn. Wrap in Ezekiel 4:9 Organic Sprouted Tortillas and you’re ready to roll. The pita pocket makes this portable and so irresistable. Whole wheat pitas are a staple at your local Middle Eastern grocer and at many supermarkets. Pile them up with lean, grilled Free-Range Lamb or Chicken sliced thin and topped with thick, Greek-style yogurt sauce, made with lots of fresh lemon, diced tomato and cuke. Fresh and Easy offers a whole wheat dough that can be thrown or shaped and toppped in a flash. Roll a thin crust and let your creativity flow. Fresh mozzarella di buffala, tomatoes and basil make it a Caprese style pie while sauteed mushrooms and Aidell’s organic chicken basil sausage give it a hearty gusto. Who says you can’t teach an old dawg new tricks? The classic gets a healthy makeover when you use grass fed, organic dogs. Try Applegate Farms Organic Hot Dogs on Ezekiel 4:9 Organic Sprouted Hot Dog Buns, topped organic mustard, ketchup and relish. There’s something about travel that brings out a carefree spirit in everyone, along with a license to splurge. Whether you’re road tripping, chasing your kids across the park or bounding around the country chasing down clients, staying healthy on the road can be an all-out battle of the binge. To satiate your snacking fix without completely sabotaging your diet or suffering a melt down (it’s hot out there, friends), put down the ding dongs and pack a host of treats that’ll keep you energized and flying high! These snacks go the distance. 1) F+V, naturally: Getting 5-9 servings of fruit + veggies a day when you’re on the road can be a feat of nature, but grab ‘n go solutions are easy if you think ahead and opt for items that stand up to the elements. Chop up bite size carrots, broccoli spears, celery sticks and radishes. Or, cut an apple with a corer and spray with Eat Cleaner to prevent browning. 2 seconds to goodnes. 2) Food Should Taste This Good: That’s the name of the brand and we love these better-for-you chips when you need a crunchy fix. Multi-grain tortilla chips are made with flax, sunflower and sesame seeds so they come with functional benefits. Flavors like Olive and Jalapeno appeal to your worldly tastebuds while Chocolate and Cinnamon satisfy a sweet tooth. Dig it! 3) Lotsa Mozz: Dairy lovers, don’t despair. Horizon Organic Mozzarella String Cheese is easy to pack and offers 7 grams of protein a stick. A quick breakfast or wholesome snack, without the hormones. String cheese isn’t just for kids, but we think eating it will make you feel younger. 4) Bars in Cars: The number of energy bars out there is a bit dizzying but we lean towards the GoLean bars from Kashi. Clean, functional ingredients like Oat Fiber, Brown Rice and Soy Protein with natural sweeteners keep you going without the crash. Chewy and Crunchy varieties let you pick your favorite texture and the flavors, like Oatmeal Raisin and Cinnamon Coffee Cake, are all good and nip a sugar craving. The House of Representatives passed legislation to give the Food and Drug Administration more authority and resources to prevent and stop food-borne illnesses, in response to a string of outbreaks involving peanuts, spinach, hot peppers and other foods. Under the House bill, the FDA would be required to conduct more frequent inspections. It would have the authority to order recalls and tell companies how to keep records so contaminated products could be traced more easily. Most food companies also would be required to register with the agency and pay an annual $500 fee for each of their facilities. Changes already are afoot at the FDA. The agency is putting more emphasis on food safety and stepping up efforts to prevent outbreaks. On Friday, FDA Commissioner Margaret Hamburg is expected to announce guidelines for the food industry aimed at preventing contamination of tomatoes, melons and leafy greens. The FDA currently can’t make the guidelines mandatory, but the House legislation would give it explicit authority to do so. The FDA also hired a food-safety expert, Michael Taylor, to help revamp the food program, and Dr. Hamburg said she wants to establish a deputy commissioner’s position responsible for food safety. Beyond that, she said she wants to hire more food inspectors and train them to be more specialized. At Eat Cleaner, we say there’s still a long road ahead but you can do a lot to take food safety into your own hands. From the July 31st online edition of wsj.com by Jane Zhang. You are currently browsing the The Cleaner Plate Club/Eat Cleaner blog archives for August, 2009.